It is time to put the closing parenthesis on a week of tragedy, the blip of insanity that comes from a man with a damaged brain and a semi-automatic pistol. Congress is coming back this week, to pick up where it left off before the bullets started flying. But will John Boehner’s message be tweaked by the events in Arizona, and the subsequent calls to curb partisan bickering, fear mongering and name calling? Rather than a mandate for a partisan, Republican agenda, the business as usual that American voters want to see changed is the crushing gridlock and the paralyzing partisanship that plows through opposition like a stroked out driver through pedestrians. To do that, of course, would require civility, which will only be restored when sane, critical thinking makes its way back into politics. For Republican activist Mark DeMoss, who recently closed his “Civility Project” because – among other things – he could only get three members of Congress (and zero governors) to pledge to be “civil in public discourse and behavior,” that is highly unlikely. “The worst e-mails I received about the civility project were from conservatives with just unbelievable language about communists,” DeMoss told the New York Times last week. “This political divide has become so sharp that everything is black and white, and too many conservatives can see no redeeming value in any liberal or Democrat. It is time to put a closing bracket on the mad, rabid growling that spits its venomous vitriol through clenched teeth, claiming to be truly American, while hanging on to every dangerous allusion they hear on the radio as a call to arm for an insurgency against their fellow citizens. Just three days before the shooting in Tuscon, Speaker Boehner acknowledged the palatable pain involved in the political discourse of the last two years. “A great deal of scar tissue has built up on both sides of the aisle,” Rep. Boehner said, in those moments after Nancy Pelosi handed him the gavel. 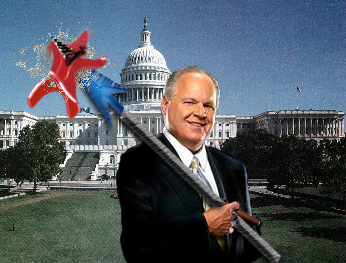 Rush knows all he has to do is give Congress a whiff of dead meat and the frenzy will begin. But as members of Congress return to Capitol Hill to resume their fighting, the tissue they will be noticing is not the pale, pink scarring from past campaigns. It is the rotting flesh that still hangs on the tip of the spear that will distract them from their discourse; one saber rattle will awaken their blood lust like a pack of wild carnivores. Their hunger aroused, they can try to do “the people’s business,” but soon they will be choosing party over people once again, salivating over the rhetorical wound they will inflict, the political blood they will spill. Sure, that’ll happen. Self-regulating rhetoric in politics seems harder to imagine than environmental self-regulation in the oil business, and they both leave a mess that will have to be cleaned up, eventually. Lead, Mr. Boehner, Ms. Pelosi, so no one will ever have to clean up the reflexive, caustic rhetoric of your respective caucuses, because of all the cans Congress kicks down the road, this is the most toxic to the future of our country. Previous Post How deep should we dig the grave?